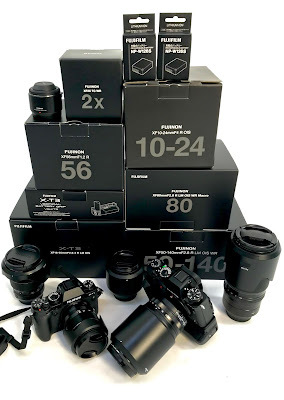 Occasionally one of the third party lens manufacturers comes up with a winning combination and this is one of those times that Tamron does so with it's latest 60th anniversary edition of the 70-300 F/4-5.6. First off Tamron didn't hold back on anything with this lens. It's got their version of image stabilizing (Vibration Control) and their latest silent auto focus motor drive (Ultrasonic Drive). 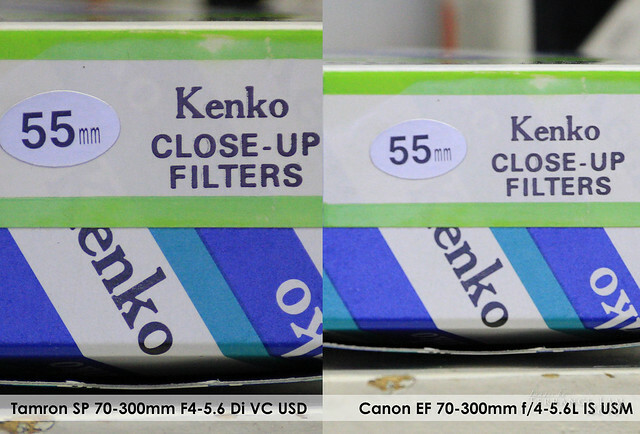 I had the occasion to compare this lens against the also spectacular new Canon EF 70-300 F/4-5.6L IS USM. Both of these lenses are priced far apart from each other, but both offer different benefits from each other. If you're one that can't bring yourself to buying anything but a brand named lens then the Canon version will not disappoint. Here's a pair of shots taken handheld. The Canon is much sharper but colour wise they both look pretty good. Both lenses control CA very well, but the Tamron is much softer and the VC motor is a little jittery. I actually found it disturbing, but I found the image stabilizer to be more stable on the Tamron than the Canon (this could be completely perception). The approaches are completely different by the two. Tamron tries really hard to hold the image stable then jumps a little to the next frame position. The Canon is more like a rubber band as it slowly bounces into the next frame position. Either way the performance is about equal. These sample shows how well these lenses holds up as a close up lenses. These remaining shots are taken on a tripod and on the 7D with IS/VC off. The higher pixel density definitely shows the weaknesses of the Tamron lens compared to the Canon. The Tamron has some lens breathing going on so the scale is much larger. Good for Tamron. Performance wise, Tamron is much better as a close-up lens. There's still some purple fringing going on in the text but generally it's still pretty sharp. On this sample you can see where the Tamron is totally trumped by the Canon one. Hands down, contrast and sharpness blows the Tamron out of the water. On the 5DmkII it's all a little more forgiving. Considering the pixel density of the 7D is so high, the Tamron fairs okay. I didn't get the chance to test the older non-L Canon but just based on perception I think the Tamron is still a better lens. Overall for the price, the Tamron is good value and is cheaper than the non L version of the Canon, but in close-up situations is much better than the L lens. I'm a macro and close-up shooter so I can appreciate how nice this lens is an up close performer. I did not test them at 70mm so not all situations were covered, but from a 300mm perspective you can certainly see how they compare. 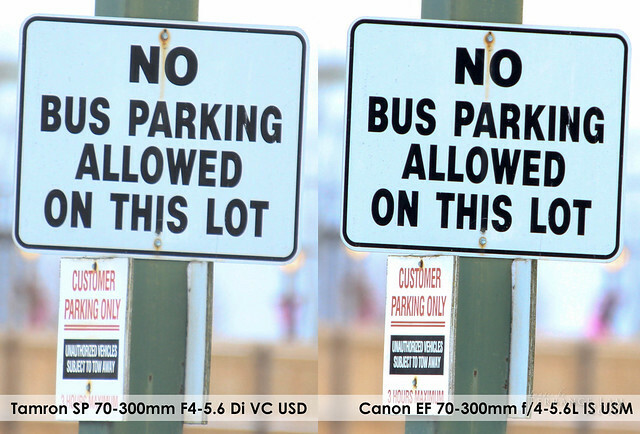 One thing I want to add here, this comparison shows how micro adjust will not make a difference on zoom lenses. The Canon is softer than the Tamron up close @300mm, but far away the Canon is significantly sharper. Calibration of a lens is very complicated, and micro adjustment does nothing on a zoom lens with these kinds of tolerances. One thing that I'll say about the Tamron is that it is consistent from one distance to another. This might be a reasonable argument to choose the Tamron over the 3.25 times more expensive L lens. The lightweight nature of this lens is probably the biggest seller of this lens. Combined with a low cost, I'd certainly still recommend it. Probably the most likely question is whether or not the L lens is worth the higher price tag. I'm not totally sure about that. If you're a L lens fan, then sure. The Tamron is not weather sealed, but has a Tri axial stabilizer (pitch, roll, yaw), while the Canon only has dual axial stabilization (only the new hybrid IS has three axial stabilization) Picture quality does tell a lot, but on the 5Dmk2 and in the close-up range, the Tamron appears to be an adequate if not equal winner. Zunächst einmal vielen Dank für all die Besuche auf meiner Überprüfung dieser.Ich möchte den Rest dieses Artikels mit ein paar Punkte, die in Ihrem Forumerwähnt wurden Vorwort. Man sollte sehr vorsichtig sein, um das Tamron auf einen L-Serie Objektiv zu vergleichen. Der Aufbau allein weit überlegen ist das Tamron-Version, sondern auch Mittelpunkt ist ein subjektiver Punkt. Ich konntePrüfvorlagen getan haben, um beide Linsen testen, aber der Punkt hier war, um ihm eine von dem, was es war wie in der Hand, nicht in einer perfektenkontrollierten Umgebung fühlen. Wie jedes Objektiv im Bereich arbeitet, ist viel wichtiger als suchen Testcharts. Das Tamron hält sehr gut, aber es ist kein CanonL-Objektiv von einer Strecke der Phantasie. Allerdings habe ich meist L-SerieObjektive selbst, und auf jeden Fall empfehlen dieses Objektiv zu einem lässigenVogelbeobachter. Ich fotografiere mit einer 100-400L meisten Zeiten, und dasGewicht des Tamron ist viel ansprechender und leichter zu tragen als diegrößeren L Glas. Das Tamron ist von hohem Wert für das, was es ist, und inmeinen Händen, Fokus und Leistung, es war ein Gewinner. Great job ... thanks for the great review!!! I would like to add a few comments to your review ... If back in the film days, I will pick the Canon ... hands down!!! But in this digital era, unless one has got buckets of cash to throw, I will opt for Tamron (btw I own the Tamron). The reason is ... if one shoot raw, with a few clicks in DPP or any RAW Editor, one can attain or even better those sharpest and contrast obtained by the Canon!!! So ... to pay for something that is 3.25 times the price for one that always hurts your shoulders and back whenever you carry it for a long, and one that scares away your subject whenever you take it out of your camera bag and finally ... an inviting subject for pick-pocket since it has got a Red ring on it ... is it worth it? Well ... the answer is YES if you are on a showy business ... just to piss your neighbour off as he can't afford one :)! I never fully tested against that specific lens, but I do know it and know it well. I can't confirm that it is better, but considering how well that this matched the L series lens in certain attributes, I'm pretty sure it will be better. For the value, it's pretty close. The only thing I wish they had done with the Tamron was to make it weatherproof. Your lens sample doesn't seem to be as sharp as some samples I've seen from this lens at 300mm. There will always be some variations in various lens samples. Sharpness has more than one parameter in it to compare and when photographing low contrast subjects the weaknesses of the lens becomes apparent over a high contrast scene like those examples. The copy I tested was only one of many I tried and Highly recommend this lens still. But it's still not going to beat the L series glass. For the price though it's hard to beat and if you're on a budget this is still a fantastic lens to own. This is a great review, how do you feel about the Tamron all these months on? I am torn between the Tamron and a used Canon 70-200 F4 (non-IS) in my price range. I think I would miss the IS though and the extra reach? How is the AF speed/accuracy on the tammron? I would be using it on a crop (60D). Did you need MFA? Is it useable indoors? in terms of shaprness in small prints 10x12 or smaller would you notice a huge difference? how does it shoot wide open? bokeh? I still highly recommend this lens to people who are looking for this specific combination and are on a budget. One thing to watch out with Tamron is lens copy variations. Although everyone I've tested has always worked well, they do not have the same testing tolerances as someone like Canon with their L lenses. The AF is not as fast as the Canon one or the 70-200 F/4, but it isn't slow either. Their USD drive is pretty snappy. It's accurate as well. I generally don't MFA lenses especially with telephoto lenses. It's a placebo that does no good to anyone unless you shoot at one fixed focal length at a fixed focal distance. However you can do it if your copy is slightly out, I would just try to find a copy that is as sharp as possible at all focal lengths and a range of distances. Is it usable indoors? 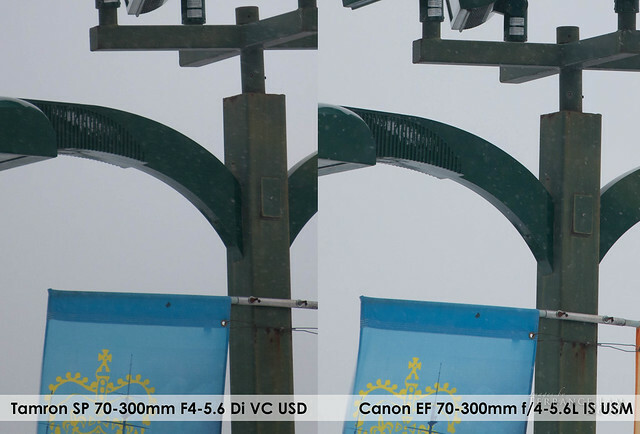 Well in terms of comparing it to the 70-200 F/4 I would say they both would have similar if not identical performances. I would say the Tamron might beat the 70-200 because it has a much closer minimum focus distance. Regardless of framing a subject, it comes down to the MFD and since this lens can focus pretty close I'd say it might be better. Also being only F/4 at the wide end of 70, having the VC in it will make it hand holdable, however the focal length of course is a consideration in all of this and will only be good for intimate or tight portrait situations. For small prints, I would say that it would be fine. In fact I'd say it's pretty good at all sizes. Wide open has some vignetting which is easy to correct for and the bokeh is comparable to most tele-zooms of this class (not spectacular and not buttery smooth but is typical of most tele-zooms). interesting point. Although I didn't find that it creeped, knowing after a little while it probably will. Had they weather sealed it it probably would never need the lock. Hi Terrance, congrats for such an amazing work! I'm about to buy the Tamron lens, but as I normally shoot big distances (my guests surfing) I'm wondering what the best teleconverter (1.4x) to coupling to the Tamron on my canon 40D. Can you help with that?